Sew what's cooking with Joan! 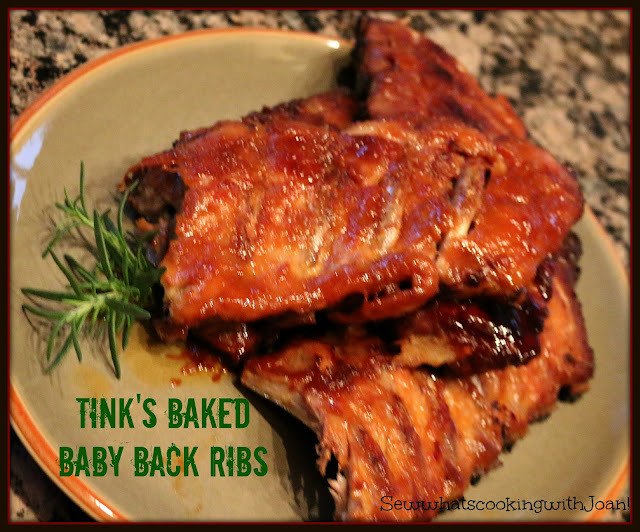 : Baked Baby back Ribs by Tink! I do believe she cracked the code to making perfectly tender and mouth-watering barbecued ribs in the oven. Oh my! Every guest went silent.....our eyes raised up to Tink's anxious gaze......YES!!!! They are delicious! Tender, fall off the bone and you may never make it any other way! I’m not going to experiment with this simple technique, because these baby back ribs took us on a journey somewhere and we couldn’t stop eating them. We seriously ate the entire pan. I won’t lie, they are amazing! 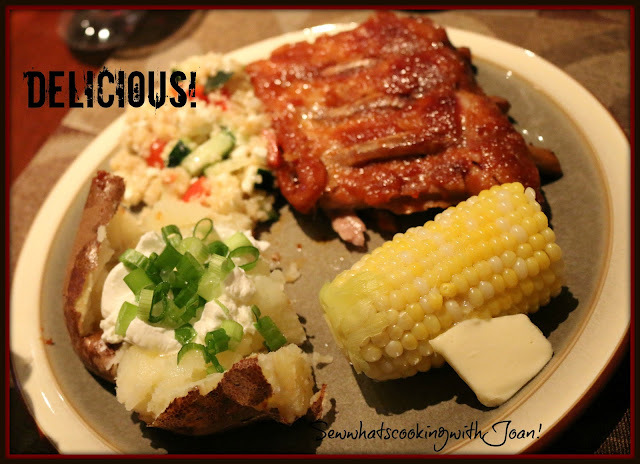 Juicy, fall off the bone tender, nicely seasoned, perfectly saucy and sticky! Everything I look for in a good baby back rib! Bring on the Wet Ones, this is on the menu at least once every two weeks!! The day before your dinner or at least the morning of, slather your favorite barbeque sauce or rub your favorite rub all over the ribs, place in a plastic bag or in foil and let marinate in the refrigerator. Can use 2-5 lbs of ribs, for the baking time accuracy. An hour before baking, bring the ribs out, let them come to room temperature and wrap each rack separately and tightly with aluminum foil. Place on baking sheet. Pre heat oven to 300 degrees F.
Bake in foil for 2 1/2 hours Let them rest, covered, for about 10 minutes, and then cut between the bones to separate the individual ribs or cut into portions for dinner. Serve immediately with extra barbecue sauce for dipping. 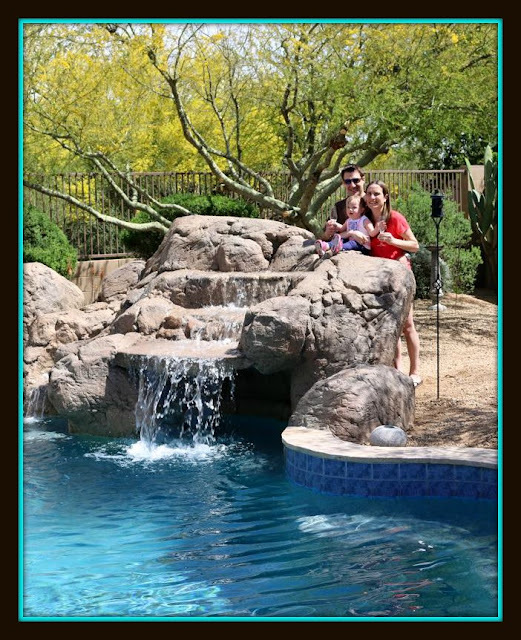 Holly, Nate and Madison Lee in their back yard! Paradise! Let me know how you like them, we loved them! !